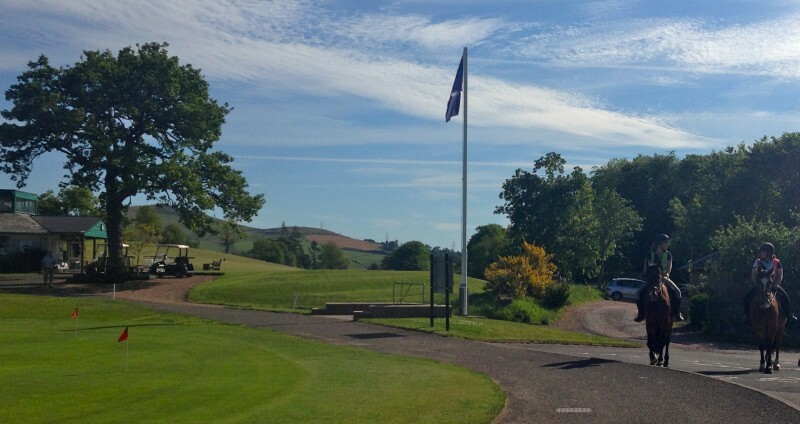 #8 Crieff Golf Club: 125 next year with plenty to celebrate! 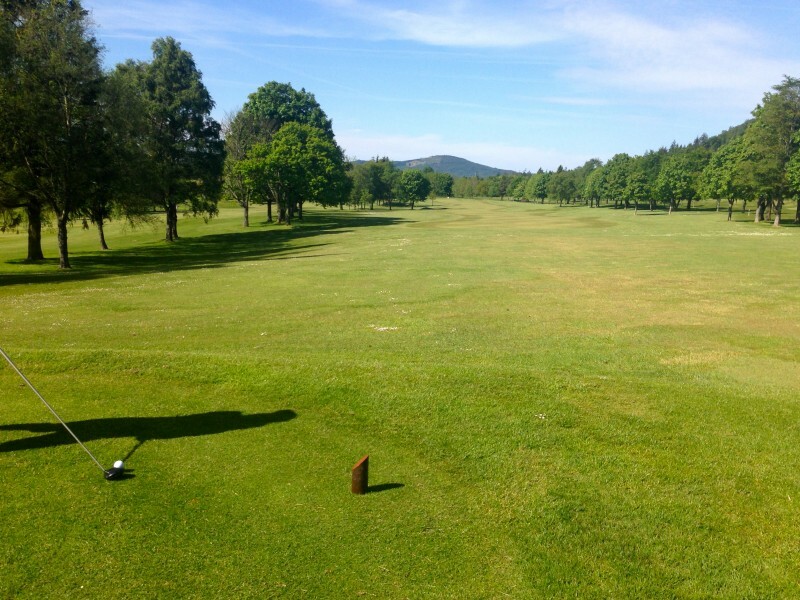 You are here: Home › Blog › #8 Crieff Golf Club: 125 next year with plenty to celebrate! #8: Crieff's Ferntower Course, plenty to celebrate! 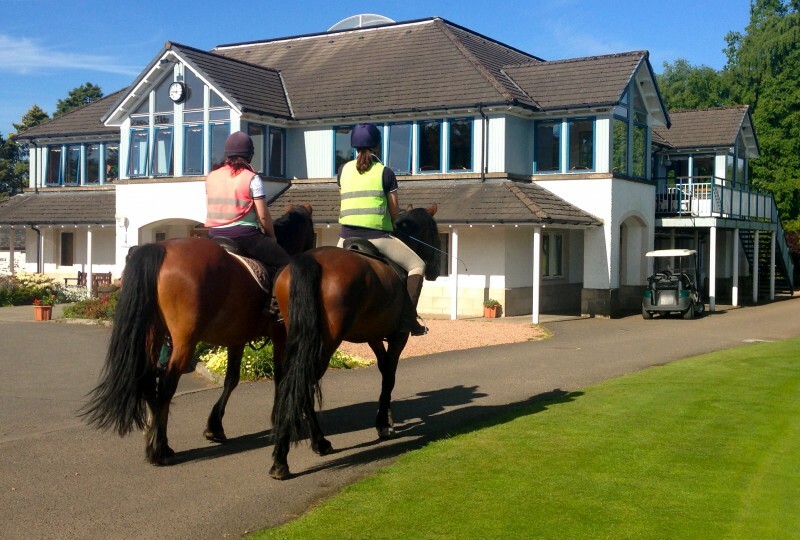 But even I was not expecting what greeted us as we arrived: a couple of girls riding their horses past the club house! We could have been in Colorado! The Crieff Golf Club is an amazing course. It is officially going to be 125 next year, and it certainly has plenty to celebrate!!! 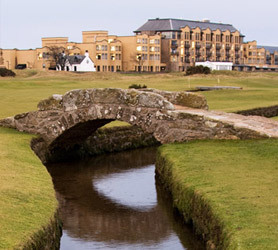 It was first laid out by Old Tom Morris, and one can feel his influence in its bunker placement, fairway direction, and thoughtful demands. 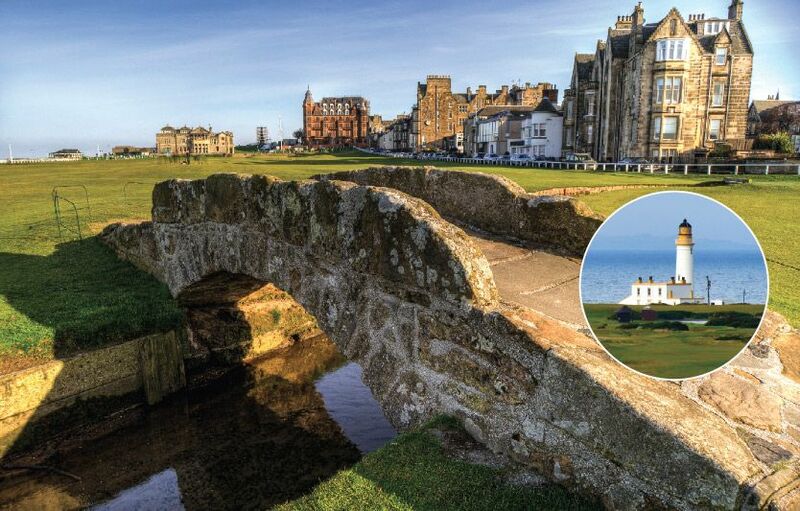 The challenging ‘Wee Knock’ is definitely reminiscent of the 11th on the St. Andrews Old Course, and is every bit as daunting. It is a course that has to be respected and ‘thought’ around. And, as such, it is a joy to play. 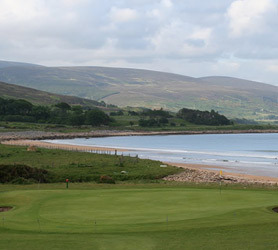 James Braid also had a hand in creating this great golf course. His influence permeates the course as it dog legs around its amazing setting. As you can see, it was the perfect day for golf. And the views over the course itself and the surrounding valleys are stunning. 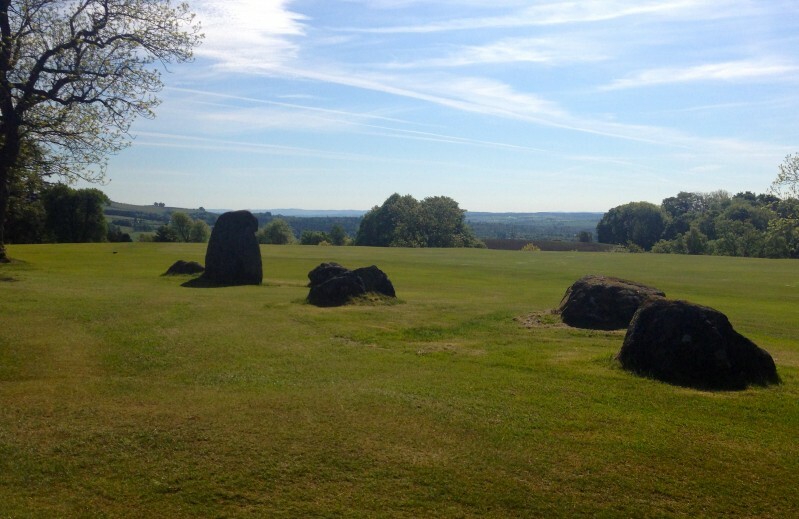 These are the rocks known as ‘the Druids’ between the fairways. And on the second, one has to look into a mirror to ensure that the fairways are clear. What fun! The third is called, ‘Wade’s Road.’ It is a reference to General Wade who in the early 1700‘s spear headed road building efforts in Scotland. The thinking was that if they (the English) gave the Scots infrastructure then that would dampen the Jacobite spirit and the followers of Bonnie Prince Charlie. Ironically, it had no such effect. Those roads actually made it easier for the Bonnie Prince and his army when they did make their bid in 1745. So, too, this fairway makes an easy route to the green, if one sticks to its middle. But unlike the Bonnie Prince, don’t be tempted to hang back. All the trouble is to the front of the green, and success is only assured if you fully commit. Something the Young Pretender as, history called him, did not do and he lived to regret it as he grew old back in France! Ann and I both played well but by the back nine we were hot and perspiring. It was an extremely warm day and we were glad we had teed off early. We were actually glad to hit our balls in the shadow of the trees to get some relief in the shade. That is something I never thought I would have to say in Scotland playing golf! When we arrived at the 14th, we were surprised to find a group of men. There they were relaxing on a bench in the middle of the golf course with their golf clubs! We looked at each other and laughed; this was not typical 'man behavior' that we were used to! We christened them the unofficial 'Crieff Men’s Coffee Club’ as there they were having a cup of coffee. Here is the proof that they were enjoying the sunshine ... and a coffee! But even more to our surprise, they let us play through them! Both Ann and I are used to the reverse: men playing through us. So it was a real treat to inform our husbands later that we had done just the opposite in our round. WE had played through a group of MEN! We both finished off strong, and one of our favouite holes was the 16th. This hole plays with the Hydro’s Ferntower in the background, and from whence the course gets its name. Here it is with it's elevated green, protected by bunkers and it is a real challenge. But it can be played coming off the hill behind, which is what I definitely meant to do with my approach shot...honest! One of the many brilliant features of the Crieff Golf Club is their wonderful green keeping staff. They were helpful and friendly, and have done an amazing job keeping this course in first class condition. They actually had to put on the sprinkler system to water the greens when we began our round. But the greens were so fast I am sure they were well off the stimpmeter! 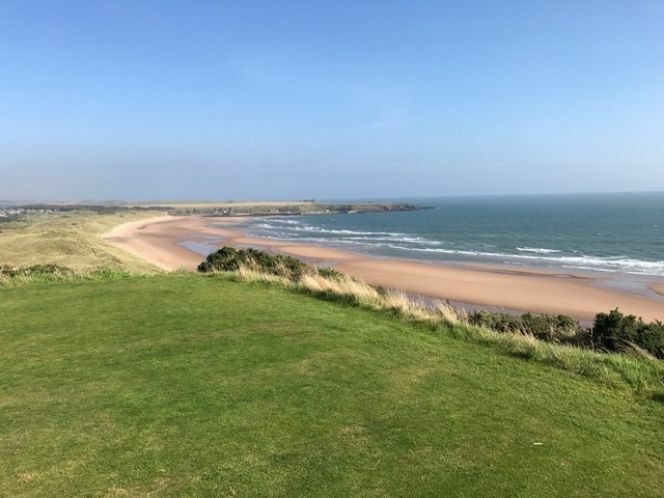 We finished the round with a couple of well deserved bogey’s and we were enjoying a cold drink on the bench at the 18th when the ‘Coffee Club’ finished. They, like us, had had a great time, but were glad to have played early. As you can see, out of bounds lurks close to the back of the 18th green, so this is not a place to go long! 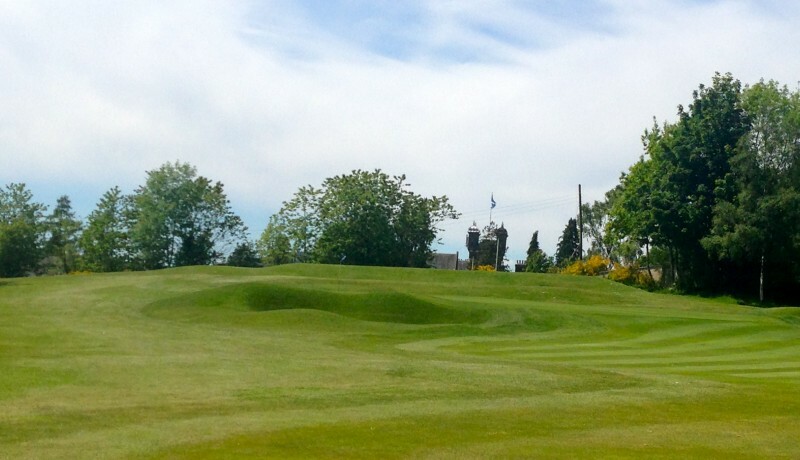 Crieff Golf Club also has a 9 hole course, the Dornock. So there are 27 holes in total to enjoy. Our greenkeeper friend told us that the Dornock is just as strong as the full 18, and we can’t wait to try it. 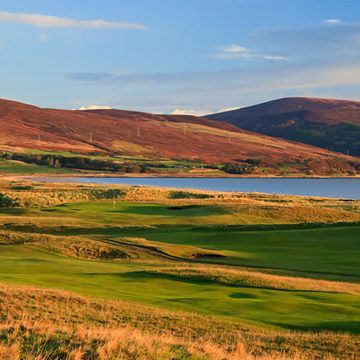 This ‘Lady of the Links’ will definitely return as soon as she can having found this 'true gem' at the ‘Gateway to the Highlands’! 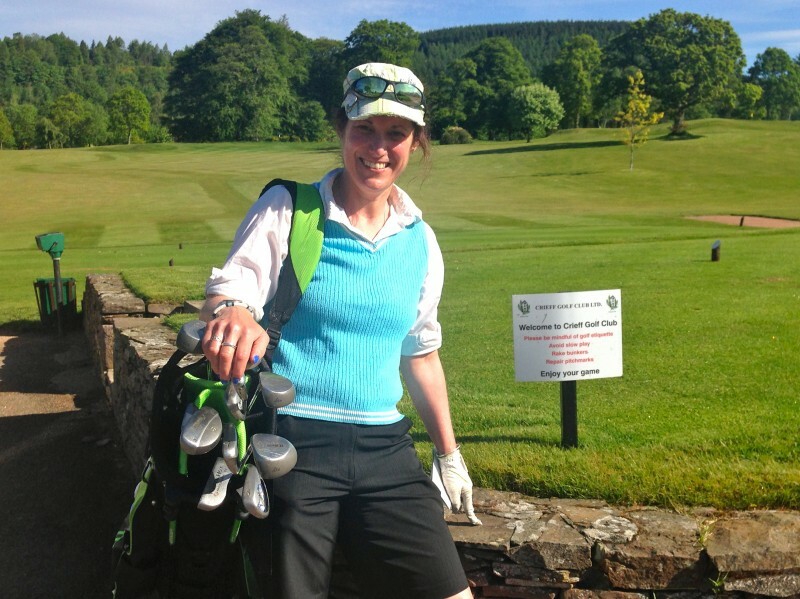 Footnote: Crieff Golf Club is 5609 yards for women with a par of 74. It has six Par 5’s and many long par 4’s as well. 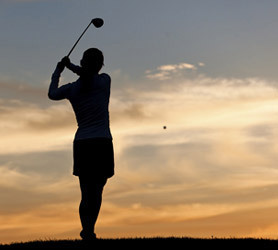 It currently has 72 Lady members and several junior girls play regularly. David Murchie is the Head Professional and has been there for 30 years. 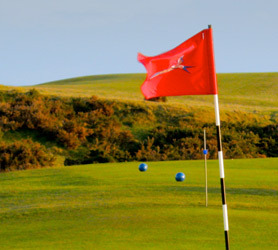 He is also the reciprocal pro for some of other local 9 hole courses in the area such as Muthill, St. Fillans and Comrie. And there are reciprocal arrangements for members at the area clubs which is common place throughout Scotland. The practise facilities at Crieff are terrific too. There is a great practise putting green to the front of the Clubhouse. 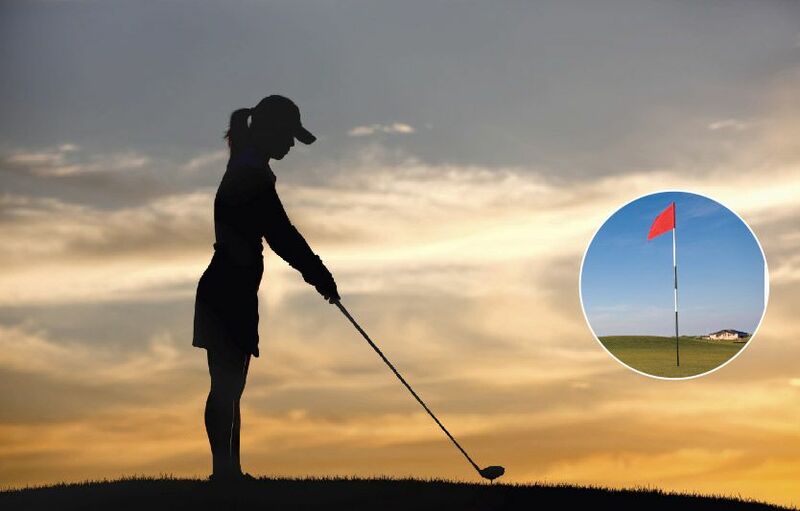 There are two driving ranges where you can bring your own shag bag, and hit away. But then you get to run and gather up your own balls adding to the exercise factor of golf at Crieff. Crieff Golf Club also offers both golf buggies and trolleys for hire.